Italian automaker Fiat reportedly is looking to acquire a bigger stake in Chrysler Group, and may seek to sell shares in its Ferrari sports-car unit in an initial public offering to help fund the purchase. Fiat, which owns 20% of Chrysler, first wants to raise its stake in Ferrari to 90% by buying 5% held by Mubadala Development, Bloomberg News said, citing a report in Il Corriere della Sera. 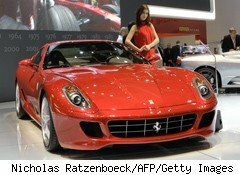 Fiat would reportedly maintain a 51% controlling stake in Ferrari, which the Italian newspaper values at $3.1 billion. A Fiat spokesman denied the report, Reuters said. "There are no plans for any Ferrari listing," the spokesman told the news agency. Fiat is expected to increase its holding in Auburn Hills, Mich.-based Chrysler to 35% once it meets restructuring goals, but has an option to grow that stake to 51%. Fiat CEO Sergio Marchionne said at a recent shareholders' meeting in Turin, Italy, that the company wasn't planning a Ferrari IPO, Bloomberg reported. At the Sept. 16 gathering, he also said that Fiat was still in negotiations to raise its Ferrari stake to 90%. Fiat formed an alliance with Chrysler in 2009, enabling the then-troubled automaker to qualify for government-backed loans. Under Fiat management, the smallest of Detroit's carmakers is busily reinvigorating its aging vehicle lineup. Marchionne has vowed to redesign or freshen 75% of Chrysler's offerings by year's end. Chrysler dealers will also sell Fiat vehicles beginning early next year: The last time Fiats were sold in the U.S. was 1984.